A trade show banner stand is a cost-effective way to add visual impact to your display and can be used in a variety of different settings to deliver your marketing message with punch. In an exhibition hall, a banner stand's large-format and eye-catching graphics help differentiate you from the competition and entice visitors to your booth. Exhibitors use banner stands to attract greater attention to their displays and enhance the impact of promotional messages. In addition to trade shows, these lightweight, highly portable banners utilize minimal space and can be used for retail store marketing, shopping malls, business meetings, stage presentations, special events and conference room displays. Banner stands are available in a variety of sizes and shapes. They enhance visibility, build brand awareness, communicate key selling points, and highlight contact information. Banner graphics including type, photography and logos can be imprinted on either fabric or vinyl material. Yet, the fabric colors can fade over time. In addition, they are not as easy to clean as vinyl banners, which can be wiped clean when soiled. Images on vinyl banners are typically more vivid and have sharper definition than those printed on fabric. As a result, they may be more striking and noticeable than imprinted fabric banners; yet are susceptible to creasing or crinkling with extended use. Retractable Banner Stands - These display banners are sometimes referred to as "roll-up banner stands" because they operate similar to a window shade. The imprinted banner is stored in the base.Then during set-up, it is rolled up or down and attached to a support rail, making assembly quick and easy. Retractable banner stands come in different heights and widths - and can be one or two-sided in design. L Banner Stands - These stands create an L-shaped frame to hold and support the banner. The short side of the L serves as the floor support. The banner is clipped in place at the top and bottom of the long side of the L to hold it in place. X Banner Stands - As the name implies, the frame on which the banner is attached for this stand is in the shape of an X. It has three legs and allows the banner to be clipped tauntly into place on all four sizes. Telescopic or Pole Tension Stands -These banners come with a telescopic pole that can be adjusted to varying heights. Banners can be easily switched out for different purposes, adding to the flexibility of these stands. Motorized, Scrolling Banner Stands -These stands come in floor and ceiling-mount models and feature a motorized mechanism that continually scrolls loop-type graphics. The height of the display can be adjusted based on the size and style of the graphics. Outdoor Banner Stands - Typically used for outdoor events or for attracting people in high traffic areas, these banner stands are constructed with heavier, weather-resistant materials. They come with a hollow base that can be filled with sand or water for stability against wind and other weather-related elements. Banner Flags - These bright promotional banner flags come in a variety of sizes and shapes, including teardrop, rectangular and feather silhouettes. Designed for indoor or outdoor use, the flags are typically made from durable polyester fabric and attach to a lightweight aluminum and fiberglass pole. The price of a trade show banner stand varies by the style and size of stand you require - and there are stands that accommodate small budgets, as well as large. 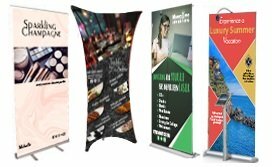 As you consider making a purchase, take into account the potential impact and variety of ways banner stands can be use din your marketing and sales efforts. If you are interested in receiving no-obligation quotes from independent suppliers of banner stands, please click here. Then, complete the short request form and check the box indicating you want to receive quotes for "Banner Stands." 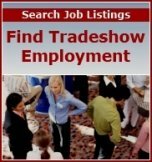 Why Invest in a Trade Show Banner Stand?